Donald Cask Kirk passed away peacefully at the age of 105, surrounded by his family. He was born in Salt Lake City, Utah on October 28, 1913 to James Henry and Francis Mary Cask Kirk. He married Olive Margaret Gayler on March 18, 1937, later solemnized in the Salt Lake Temple. Donald has seven children, Marjorie (Zed-deceased) Braden, Marilyn-deceased (Jerry-deceased) Harden, Donalyn (LeRoy) Knighton, Richard (Linda-deceased) Kirk, Sharon (Stan) Swallow, Bonnie (Steve) Smith, Lorraine (Ralph) Kimball; he has 37 grandchildren, 99 great-grandchildren, 36 great-great-grandchildren, 1 great-great-great-grandchild. He was preceded in death by his wife, Olive; his parents and all 12 of his siblings. 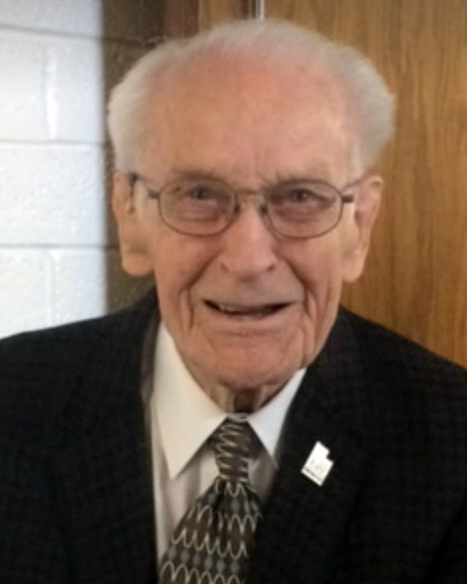 He was an active member of the Church of Jesus Christ of Latter-day Saints his entire life and loved serving in all the many positions he held. He loved missionary work and temple service. Upon graduating from West High School, Don started working for W.P. Fuller Paint in Ogden UT. With this company he was transferred to SLC UT, San Francisco CA, Boise ID, and in 1960 back to SLC UT. After working for 37 years, he retired from Fuller Paint. He then went to work for Intermountain Glass and Buehner Block. He retired at 75 years old. Don loved fishing, mountain climbing, horse riding and dancing. The family would like to thank the staff at Cedarwood and Encompass Hospice for their loving care of Don.